White Rabbit dye made the most beautiful eggs. I received my eggs in fine condition from eBay. 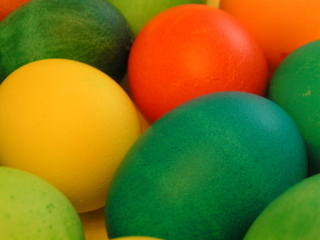 Each egg had only one tiny pinhole--too small to hang but look lovely in a bowl. Very fun to do with Aidan who took the job seriously. Check out that beautiful yellow one! I made two batches of cupcakes tonight using recipes from a recent Southern Living issue. I'll post pictures tomorrow. So cute with Easter liners and cupcake picks!